Sometimes when a holiday rolls around and your kids have kids and families, things will get turned around a little bit and different plans are made and in the midst of all the changes we have a choice to feel left out or betrayed or we can embrace it and discover the possibility of new traditions. When a couple family members decided to get away a couple of days over the Thanksgiving break our family chose to embrace it and try something new. Something different. 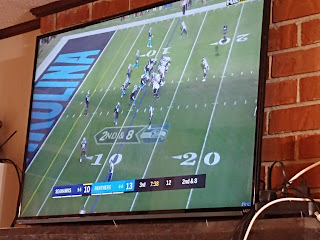 Meaning when Thanksgiving did not happen on Thanksgiving Day it did happen on Sunday and guess what? The world did not come to an end. That's right! We not only survived, we thrived. The only thing different was the day. 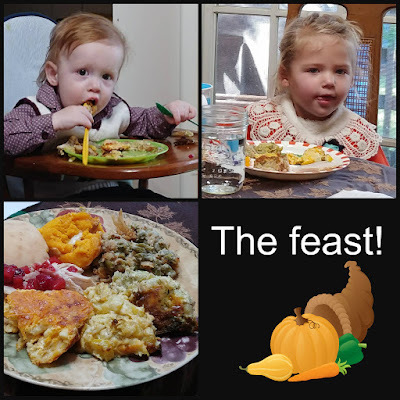 We still had all the traditional family foods followed by the traditional feelings of why the hell did I eat so much followed by another plate or three. AND I got my tree decorated! 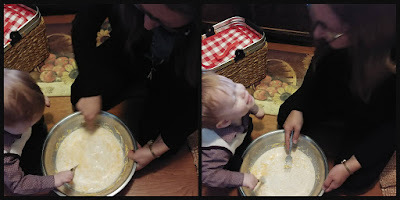 AND the grandbabies were here to help! This could very well become a new tradition in our family. When TeacherDaughter is in the house, every moment is a teachable moment. Opie wanted to help cook the mac and cheese and TeacherDaughter let him. When the lovelies were growing up we always decorated the tree Thanksgiving weekend or at least no later than the following weekend and what I discovered when they grew up and move out was I hate decorating the tree alone so this solves that problem. Seriously, who doesn't enjoy decorating the tree when grandkiddos can help? Once the kids grow up and move out, we have to be willing to make adjustments, especially during the holidays. I am one of those stickler people who like to celebrate a birthday on the actual birthday, Thanksgiving on Thanksgiving Day, Christmas on Christmas Eve and Day. I don't go for this 'well, your birthday is on Thursday so we'll celebrate over the weekend or celebrate Thanksgiving in October or Christmas on New Year's Eve but what we empty nesters find out rather quickly is when our kids grow up and move out on their own we have to be willing to make adjustments. Otherwise, we might get left out altogether and nobody wants that, I know I don't. So, we adjust. Some pictures were blurry but I think y'all can see how much he enjoyed helping! I'm not going to say I didn't feel sad at first especially since this is our first big holiday season without Mother so all that sentimentality and melancholy and those sweet childhood memories of the way we celebrated each holiday as a family becomes even more emotional when you find out one or both grandchildren will not be able to come on the actual Thanksgiving Day and you do tend to feel a little bit let down. If we are not open to change we're going to be very disappointed and have a lot of sadness in our lives. The problem is if you let that disappointment take hold you're not going to be open to the possibility of trying something different. It's true I am not one of those who is always open to change because tried-and-true is my thing and because I like comfort and because I am not a fan of uncertain and the unknown. But what I dislike more than change is the very thought of celebrating with only one or two people or not celebrating at all when I have to do is make a change and we can almost all be together. If we are not open to doing something different every once in a while, we're going to be very disappointed and have a lot of sadness in our lives. overabundance of food but I think we handled it well. All that to say, our family celebrated Thanksgiving 3 days late this year, on Sunday. We had the traditional Thanksgiving feast and everyone was here except NashvilleDaughter and DrummerBoy but they always spend Thanksgiving with DrummerBoy's family plus his sweet family had a funeral over Thanksgiving which is never easy but even harder over the holidays. 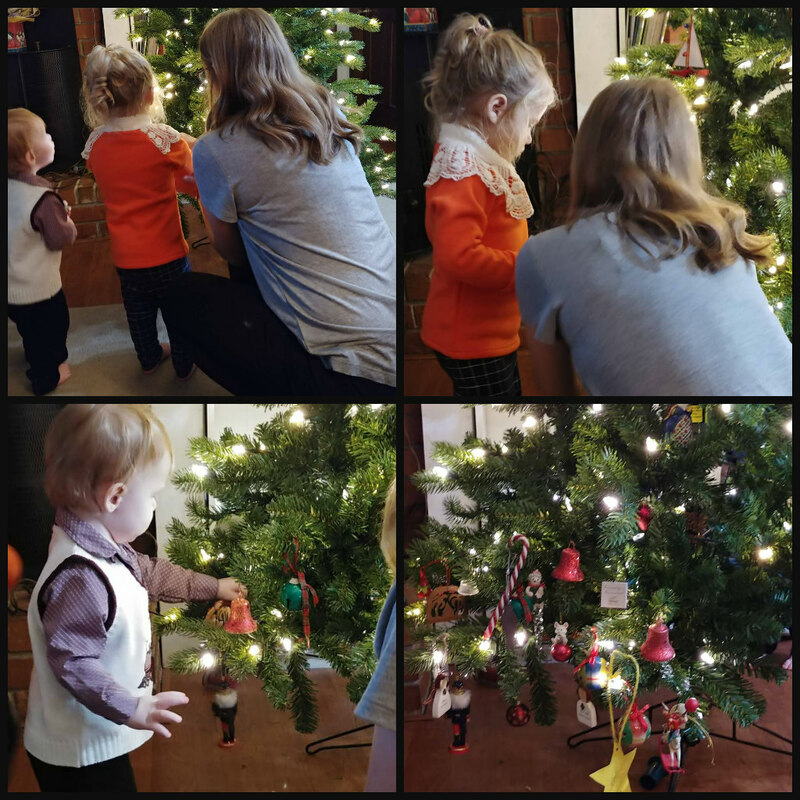 So, we gathered with our feast on Sunday, we played games, we made plans for Christmas (when we will all be together and then some), we set up my Christmas tree, and the grandbabies were here! If I had not been open to doing something different I would have missed out on one of the most wonderful Thanksgiving celebrations we're had in our history of family Thanksgiving celebrations. What it boils down to is what is more important- the reason behind the change or getting to spend time with our family? So, friends, things are not always going to stay the same but if we are willing to be open to doing something different we may find even more joy in that than we did in previous celebrations. Be open to doing something different and always, always be willing to do what it takes to spend time with your family. Don't overthink it. What it boils down to it what is more important- the reason for the change or getting to spend time with family? Spoiler alert! It's spending time with our family. Do they want to celebrate on Sunday instead of Thursday? Do it. Would they rather you come to their house? Go. Are their in-laws extending an invitation to you? GO. Are they asking you to give up Thanksgiving but they'll be home for Christmas? Do it. area and holds about 50 ornaments. Be flexible. Be willing. Open your hearts to new and exciting celebrations. 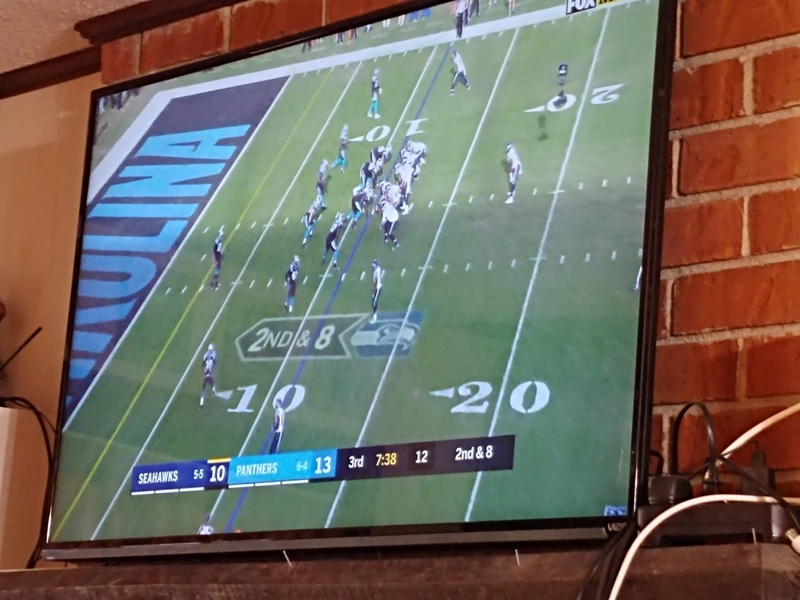 Just make sure there's a television nearby for watching football. Just sayin'. Amen! We celebrated Thanksgiving on Friday this year due to my new job and it really wasn't all that different once we all adjusted our minds to it. Christmas will be a similar affair as I work that day, too. We'll have our dinner with our daughter's family and my mom and stepdad and open presents when I get home. 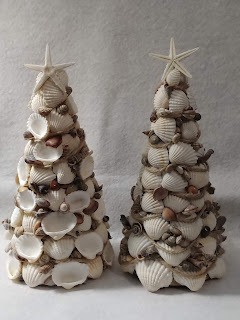 Christmas with both of our children and their families will be the Saturday after and Mom will miss it as she and my stepdad leave that day for a 3 week cruise. It has taken a little bit to embrace the changes in tradition...I admit that the first Christmas my husband and I found ourselves alone on Christmas day I had myself a big old pity party, but the next time it happened, we went to a movie and enjoyed our own company. It's all about attitude. Kudos to you for accepting change right of the bat! It does take time to embrace the changes but it really is worth it, I agree. Adjustments are not always the easiest things to do but when we do, we reap the most amazing benefits! I love that y'all have embraced the changes! Thanks so much for sharing! I agree - as parents and grandparents, we simply have to adjust to our family’s needs, especially when in- laws become involved. Perhaps it’s easier for me, as I was an only child and had two children, so I was never used to large family gatherings! I haven’t spent Christmas with my oldest daughter and Eleanor for a few years now, since they’ve been living in Ibiza. I’m grateful to have my youngest daughter and Eli and Ruby living only five minutes away. We really do. I can't imagine having the grands living far away and I hope I never have to experience it. But, if I do I hope I find some grace with which to do it. I am so lucky that my daughter-in-law's family has welcomed me with open arms. So now their holiday traditions are my holiday traditions. I have learned it's more important WHO you are with then when the celebration occurs. Well, of course they did! Who wouldn't welcome you with open arms? Everybody loves you, Suzanne! I love how you just packed up and moved over there and jumped right into life in CA. I'm also sad you're not living here anymore. But hey! Grandkids are always worth it. So true, the WHO is the most important part. We do have to grow and change but I know some who have such trouble with it all and want to make things worse. I'm all about doing what has to be done to be together like you are. When I was growing up, we had it SO great because the Sunday BEFORE any big holiday was celebrated at my dad's folks with all the cousins, aunts, uncles, etc., and the Sunday AFTER any big holiday was celebrated at my mom's folks with all the cousins, aunts, uncles, etc. That way, we had THE holiday at our own house and usually the grandparents came around later in the day anyway. THREE Christmases, THREE turkey dinners... you get the idea. It sure worked for us and everyone else related. You are right... be flexible!! Life is to be loved! Oh goodness! What a fabulous idea! Maybe we'll start something like that here. Wait, that would mean we celebrate twice at my house. LOL I love the way your family did Christmas! How nice that you feel good enough to do this. Its always nice to have little ones around to help no matter the day. Lovely pictures. I am so sorry about your Mom. Firsts are always so hard. Well you know all about my life and how changes are. I wish Ben and Megan could have stopped by to see you. That would have been fun. Changes Pam, I am afraid, not doing as well as I hope nor as good as you. I have been on the ropes with so many that are overwhelming me every day. There are still so many things to be thankful for. Bless you Pam. I hated to miss them. Life comes at me full steam ahead it seems every day and I am convinced the Santee bunch are trying to end me. Please send me an email. We need to catch up! My daughter has always gone to her partner's family for Thanksgiving. I haven't seen her in years for that day. This year due to family health problems of her partner's, they stayed home and my daughter cooked for all the family. There were 12 of us. Which is a lot considering both Mandy and Matt are only children! Mandy did a great job and everyone had a splendid time. I'm hoping this will be the new normal. I love it when both sides of the family come together. We have done that with one group but NashvilleDaughter and DrummerBoy do Thanksgiving with his family and Christmas with us. We're trying to get his parents to join us for Christmas this year and make that a new normal. Me, too. We just have to be willing to adjust. I know some empty nesters who just can't do it, though and it causes such problems with their relationships with their kids. I'm glad the world did not come to an end. I know I've been making adjustments since Adam and Gabby got married and the world keeps on spinning!!! So glad it all worked out for all of you. You are so very right...flexible is very important. We don't get either girl or the grandson for Thanksgiving or Christmas! It's sad, but we'll make do with video chats and whatever we can get. It's not what I want, but it is what it is.